Why do women’s sizes look so different in different shops? One thing that should be certain, though, is your size. Surely, your jean size in one shop is your jean size everywhere, right? Er, wrong, as one woman has illustrated in this viral tweet. The jeans are all labelled as size 12 – but that’s where the similarity ends. Chloe Martin, 18, posted the image last Friday with the caption “In case you’ve ever wondered why women get so frustrated with our clothing sizes” and it has clearly struck a chord with shoppers, picking up over 100,000 retweets in the following days. Chloe explained in a subsequent tweet how the variation in sizes was baffling, with the replies showing that Chloe was not alone in her frustrations. Some tried to see the funny side of the issue. Chloe explained how it has affected her shopping habits: “I normally would like to do most of my shopping online, but it’s getting harder because you can just never tell if your size will fit you, and when you’re physically shopping in a store, sometimes I’ll have to take in three different sizes of the same item just to make sure one fits. The latter point is illustrated perfectly by the fact that four of the pairs pictured come from the same two shops, yet all appear differently sized. The seven pairs, from top to bottom, are from New Look (skinny jeans); Pull & Bear (mom jeans); Bershka (normal mid-waist); George at Asda (skinny jeans); Matalan (skinny jeans); Bershka (mom jeans); New Look (skinny jeans). All brands were contacted for a response to the issues raised by Chloe’s tweet; New Look was the only to reply, and declined to comment. As well as complicating a shopping trip, Chloe points out that these wild variations in clothes sizes can also have an effect on body image. Kitty Wallace, Operations Manager of the Body Dysmorphic Disorder Foundation tells BBC Three: “Inconsistencies with clothing sizes are not helpful for anyone experiencing body image issues. 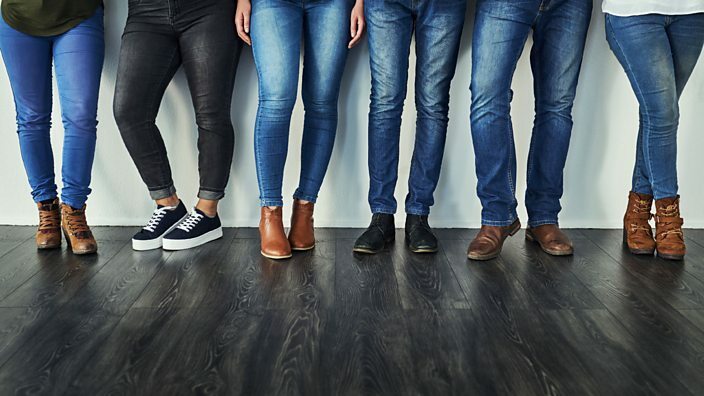 Men’s clothes are sized in inches or centimetres which is factual and accurate, whereas women’s sizing – ie 8, 10, 12 – is hugely confusing and can be demoralising, particularly as some women overly worry about what size of clothes they are buying. However, a new initiative is attempting to help solve the problem and create standardised sizes in the UK. A nationwide survey, sponsored by six major retailers and involving leading universities, is aiming to measure 30,000 adults via an app. Users upload two photographs of themselves and submit basic personal information including age, weight, height, gender and ethnicity in order to create a database for retailers, which they can use to update their sizing charts. In the meantime, the tweet is a helpful reminder not to stress over what clothes size you are, or to worry if you’re not fitting into your usual size at a different shop.